FORT WAYNE, Ind. - Curt Witcher, The Genealogy Center Manager and Senior Manager of Special Collections at the Allen County Public Library, has been honored as a 2016 Hoosier Hospitality Award winner. 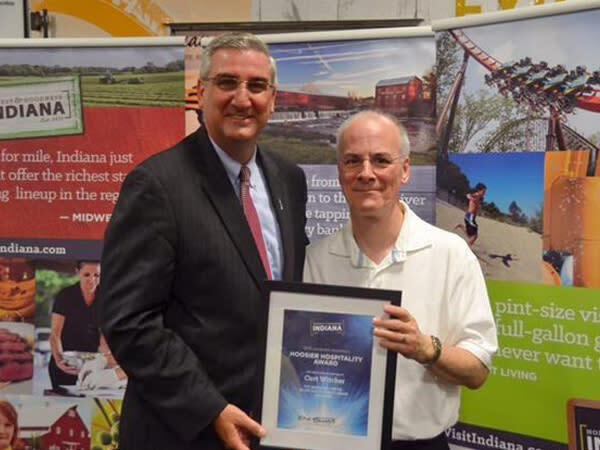 Witcher accepted the award from Lt. Indiana Governor Eric Holcomb and Visit Indiana at the Indiana State Fair in Indianapolis, IN on August 19. Each year, the Indiana Lt. Governor&apos;s Office and Indiana Department of Tourism recognize frontline employees for their hard work and dedication to the state&apos;s hospitality and tourism industry. 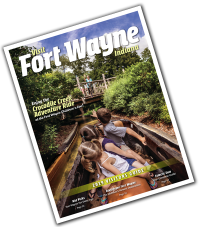 Visit Fort Wayne nominated Witcher for his commitment and excellence in enhancing Fort Wayne and Allen County&apos;s tourism industry. "The Hoosier Hospitality Award is such an honor, and definitely serves to recognize the important role the Allen County Public Library serves in the community, and specifically the role The Genealogy Center plays in offering engaging customer experiences to a nation of visitors," Witcher said. Witcher welcomes more than 100,000 professional genealogists and leisure visitors each year. Along with Witcher, the talented Genealogy Center staff works with visitors to discover their family history, while making them feel at home with our famous Hoosier hospitality. "Our dedicated, expert staff bring all the enjoyable components together so that each visitor leaves with a feeling of success, already thinking about the next trip to the Summit City and Allen County Public Library," Witcher said. For more information on the 2016 Hoosier Hospitality Award, contact Visit Fort Wayne President Dan O&apos;Connell at 260-424-3700.